In his morning appointments, the Pope received Cardinal Jose Saraiva Martins CMF, prefect of the Congregation for the Causes of Saints. Departing from the usual Vatican practice of a semipublic consistory for the declarations of causes, the Holy See announced that, during the prefect's audience, Pope Benedict "authorized the Congregation" to publish his green-light for two causes for canonization, a whopping 327 beatifications and seven instances of "heroic virtue," the "venerable" whose causes require miracles before they may proceed. 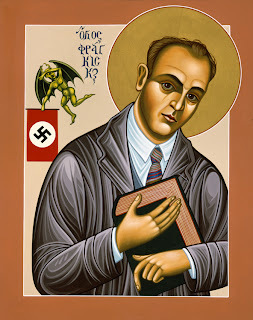 While among the new Blessed are to be found 127 martyrs of the Spanish Civil War and 188 from 17th century missionary efforts in Japan, the day's standout declaration is that of the martyrdom of Franz Jägerstätter, an Austrian whose conscientious objection to the Nazi draft led to his beheading in 1943, aged 36. As the grip of the Third Reich tightened in the late '30s and early '40s, Jägerstätter lived as a husband and farmer and served -- after, so it's said, a "wild youth" -- as a parish sexton in rural Austria; his widow, Franziska, is still alive at 94. After he was ordered to join the German army in early 1943, despite pressure which reportedly came even from the ecclesiastical authorities, he refused, was promptly jailed, and killed at Berlin within six months. Jägerstätter has long been an icon of the peace and non-violence movements -- in the Vietnam era, his witness was upheld by no less than the brothers Berrigan, Thomas Merton and Dorothy Day. However, today's declaration from the Holy See ends a years-long push for his cause to be declared a martyrdom by Rome, thus paving the way for his beatification without a miracle. [B]y 1936 Jägerstätter was a firm and active believer and began serving as the sexton in the local church. Around that year, he wrote to his godchild with the boldness of spiritual expression that was characteristic of him: "I can say from my own experience how painful life often is when one lives as a halfway Christian; it is more like vegetating than living." And he poignantly adds: "Since the death of Christ, almost every century has seen the persecution of Christians; there have always been heroes and martyrs who gave their lives — often in horrible ways — for Christ and their faith. If we hope to reach our goal some day, then we, too, must became heroes of the faith." In the meantime, he went about his business, much like others, but with important differences. He had three children and a farm to run, but Jägerstätter did not use family needs as an excuse to deviate in the slightest from what was right. He stopped going to taverns, not because he was a teetotaler, but because he got into fights over Nazism. At the same time, he practiced charity to the poor in the village, though he was only a little better than poor himself. The usual custom in the village was to give a donation to the church sexton for his help in arranging funerals and prayer services. Jägerstätter refused them, preferring to join with the faithful rather than act as a paid official. The period of self-discipline prepared him for much more demanding sacrifices. When the Nazis arrived, not only did he refuse collaboration with their evil intentions, he even rejected benefits from the regime in areas that had nothing to do with its racial hatreds or pagan warmongering. It must have hurt for a poor father of three to turn down the money to which he was entitled through a Nazi family assistance program. But that is what he did. And the farmer paid the price of discipleship when — after a storm destroyed crops — he would not take the emergency aid offered by the government. As the Nazis organized Austria, Jägerstätter had to decide whether to allow himself to be drafted by the German army and thus collaborate with Nazism. Two seemingly good reasons were given to him, sometimes by spiritual advisers, why he should not resist. First, he was told, he had to consider his family. The other argument was that he had a responsibility to obey legitimate authorities. The political authorities were the ones liable to judgment for their decisions, not ordinary citizens. Jägerstätter rejected both arguments. In normal times, of course, obedience to authority may be required even when we disagree on certain policies. But the 1940s in Austria were not normal times: to obey for obedience’s sake would have been to do what Adolf Eichmann would later plead in his trial in Jerusalem — he was just following orders. The consequences of Jägerstätter’s position were obvious: "Everyone tells me, of course, that I should not do what I am doing because of the danger of death. I believe it is better to sacrifice one’s life right away than to place oneself in the grave danger of committing sin and then dying." But he serenely decided that he could not allow himself to contribute to a regime that was immoral and anti-Catholic. Jägerstätter was sent to the prison in Linz-an-der-Donau, where Hitler and Eichmann had lived as children. According to the prison chaplain, 38 men were executed there, some for desertion, others for resistance similar to Jägerstätter’s (no others have been positively identified). His Way of the Cross would not be long. In May, he was transferred to a prison in Berlin. His parish priest, his wife and his lawyer all tried to change his mind. But it was useless. On Aug. 9, 1943, he accepted execution, even though he knew it would make no earthly difference to the Nazi death machine. A Father Jochmann was the prison chaplain in Berlin and spent some time with Jägerstätter that day. He reports that the prisoner was calm and uncomplaining. He refused any religious material, even a New Testament, because, he said, "I am completely bound in inner union with the Lord, and any reading would only interrupt my communication with my God." Very few men could have made such a statement without seeming to be in denial or utterly mad. Father Jochmann later said of him: "I can say with certainty that this simple man is the only saint I have ever met in my lifetime." Jägerstätter is the second Nazi-era resister to be beatified by Benedict XVI; in the fall of 2005, the German-born pontiff beatified Cardinal Clemens August von Galen (1878-1946), the "Lion of Munster" whose residence was firebombed in light of his outspokenness against the regime. Von Galen died less than a week after returning from Rome and the reception of his red hat.